BVP CET 2018 is been conducted by Bharati Vidyapeeth University for admission into various UG and PG courses that are offered by the BVU and their affiliated colleges. Bharati Vidyapeeth Deemed University was established in 1996 and it has 29 Constituent units and perhaps it may be the largest multi-disciplinary multi campus university of its Kind in the country and is catering to the needs of Urban and Rural students. 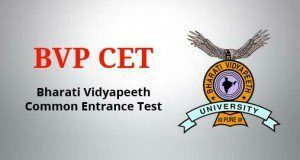 Each and every year there are thousands of candidates who appear for BVP CET, for the 690 undergraduate seats of the university. Candidates must have passed their Higher Secondary Certificate Examination (HSC) or the Indian School Certificate Examination (ISCE) or any other examination equivalent to 10+2 or HSC examination from any recognized university. Candidates have to qualify their 12th with Physics and Mathematics as compulsory subjects along with one of the Chemistry/Biology/Biotechnology/technical Vocational subjects. Candidate has to obtain at least 45% marks (40% marks SC/ST) in the above subjects taken together. Candidates who are appearing for the qualifying exam can also apply, but before the counselling they gave to make sure that they have their original certificate. Candidate has to complete 17 years on or before 31st December 2018. Candidates have to qualify their Higher Secondary Certificate Examination (HSC) or the Indian School Certificate Examination (ISC) or any other examination equivalent to 12th or HSC examination from any recognized university. They have to secure at least 50% marks (40% marks SC/ST category) in PCB or Biotechnology taken together in the qualifying examination. Those candidates apply for BAMS programme, they have to clear their 10+2 with PCB and obtained at least 50% (40% SC/ST) marks taken together. For BHMS, candidate has to qualify their 12th with PCB and English individually and secure at least 50% marks (40% in case of SC/ST category) in Physics, Chemistry, Biology/Biotechnology taken together. For MCA full-time, candidate has to pass minimum 3 year duration Bachelor Degree with Mathematics as a course at 10 + 2 level or at the graduate level. For MCA lateral entry, candidates have to qualify minimum 3 year duration Bachelor Degree in BCA, BCS, B. Sc (IT/Computer Science) with Mathematics as a course at class 12th or at the graduate level. Candidates have to obtain at least 50% (40% in case of SC/ST) marks at the qualifying examination. Candidate should be Indian Citizen. There is no age limit to apply for this exam. Graduate candidate with Bachelor or Master Degree from any discipline can apply. They have to secure minimum 50% marks in aggregate (40% in case of SC/ST category). Candidate must qualify BDS examination from a recognized Dental college. Candidate has to complete 1 year compulsory rotating internship on or before 31 March, 2018. Candidate should possess a permanent registration with any State Dental Council or Dental Council of India. To get admission in PG Dental courses, the candidate has to secure 50% marks (40% marks in case of SC/ST category) in the DENPET 2018. Candidate must have passed MBBS examination from any Medical College recognized by the Medical Council of India. Candidate will have complete 1 year compulsory rotating internship on or before 30 April, 2018. Candidate should have a permanent registration with any State Medical Council or Medical Council of India. If any candidate completed their MBBS from outside India from the university that is recognized by the MCI and must possess a permanent registration certificate from Medical Council of India or from a State Medical Council in India. He must also have completed one year internship in a recognized Medical College in India. The Application forms for BVP CET 2018 are available in online and offline modes from the 1st week of May 2017. The application form will be available in the official website , the candidates have to fill the form online and have to pay Rs.1500 through internet banking/credit card/debit card before the deadline. In case of delay in the application will be directly rejected. Candidates can download the application form from the portal or they can purchase the form in person form the office(Application forms office : Bharati Vidyapeeth University and Institute at Pune, New Delhi, Mumbai, Sangli, Kolhapur, Solapur, Karad, Palus and Kadegaon). Bharati Vidyapeeth Bhavan, L.B.S. Marg, Pune 411 030. Candidates must procure a proof of the draft and the dispatch of the application form. It may be useful for obtaining a duplicate a duplicate admission card if required. Applicants are advised to invariably mention their application number (as printed on it) and their names on the back of the Demand Draft. The application sent by mail must be sent by registered post/speed post/courier. There are total 200 objective type questions of 1 mark each from the subject Physics and Mathematics. The question paper comprises of 100 questions from Physics and next 100 questions from Mathematic. The exam duration to complete the BVP CET 2018 exam within 3 hours. There will not be negative marking for encumbers of attempts the candidates make. Admit Card will be dispatched on receipt of the completed application form. If the candidate does not receive the admit card in the given dates, then they have to contact the officials and the candidates have to bring two copy of their authenticated photograph along with their proof of submission/mailing of application form. Then only the conducting authority will issue them duplicate admit card. The results will be published in the official portal in the 1st week of June 2018 and merit list will be prepared on the basis of marks candidate will obtained in the entrance exam. Merit Lists will be separately prepared for regular candidates as well as Foreign /NRI /PIO /Management Merit candidates. Candidates will be called for the counselling process on the basis of their merit and the seat will be allotted on the basis of the merit and availability of the seats. The university will dispatch counselling and on spot selection invitation to the first 5000 candidates in the merit list of CET Engineering 2018. No Individual counselling letters will be sent to MCA & MBA merit list candidates.